When your roof is severely damaged and leaking, it’s obvious that it needs to be replaced. But more often than not, it can be hard to tell when a roof is ready to be replaced. Some wear and tear can be spot treated with replacement shingles, but other times a roof has reached the end of its life and needs to be completely replaced. Look for these warning signs that your roof needs to be replaced. If you see any of these red flags, give us a free call and we can help you decide the best steps to take. Think about all the daily challenges your roof faces: scorching sunlight, soaking rain, heavy snow, pounding hail and more. Roofs are designed to withstand strain, but eventually they reach their breaking point. If your roof is more than 25 years old, it may be time for a replacement. Even if your roof looks fine from the ground, there could be unseen damage. It’s time to call a roofing contractor to review your roof. Damaged shingles are often the first warning sign that your roof needs replacement. The odd shingle here and there can be replaced, but if you notice multiple shingles across different parts of your roof that indicates widespread weathering. Curling, cracked and buckling shingles are signs that your roof needs to be replaced. 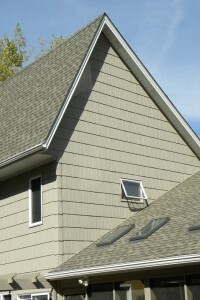 Damaged shingles let in leaks and are also weak against wind uplift and ice damage. Shingles frequently need to be replaced, but if you notice that you’re replacing more and more it may make more sense to simply renovate your whole roof. Since it’s so difficult to color match shingles, many homeowners opt to renovate their roof for a more uniform look. A big warning sign is shingles missing in a valley (where two points of the roof meet) because this impacts your roof’s ability to drain water and snow. As shingles age, they start to shed. If you notice granules in your gutter and your roof is more than 10 years old, it could mean your shingles need to be replaced. If you recently had your roof replaced and notice granules, it could be an issue with the roofing installation. A roofing contractor will be able to tell you the best steps to take. This might be obvious, but it’s worth mentioning. If sunlight is poking through, that means that water and cold air can too. Some leaks can be fixed without replacing a whole roof, but multiple openings is a bad sign. Contact a roofing contractor immediately to ensure your roof is safe. Ready to replace your roof? At Chuba, we provide excellent remodeling services. Our dedication to quality service using top-quality building products and a high level of attention to detail ensures we will be your partner in producing your dream home. Contact us today for an estimate!